The collage application for upholstery has been around for years, but has gained the reputation of being a predominately country look. In this post, we want to share some cottage decorating ideas on various ways to use multiple fabrics on a single piece to achieve a unique and individualized look, but in a modern way. Whether it’s a two-tone collage or a 15 fabric patchwork collage, the possibilities are endless. Here is a quick reference photo that labels the sections of a sofa to help visualize where fabrics can be positioned. The same terms can be used to describe accent chairs as well. Determining the size of the piece you want to collage, and how many fabrics to use, are the two hardest questions to answer. Keep in mind that the bigger the piece and the more fabrics you use, the more intense the overall look. If you want a sofa with an eclectic look, but want to control the intensity, choose a limited number of fabrics that are softer on the eyes. If you want an eclectic look with a lot of personality, go big and go bold! Use a variety of fabrics in bold tones to design a look that shows off your creative nature. The warm tones of the reds, greens, oranges and blues in the sofa below create an electrifying result. It’s not for the faint of heart, as it truly makes a brave statement. Using the collage application on an accent chair tends to be a more popular choice, because the scale allows for just a hint of eclecticism without dominating the space like a full size sofa would. 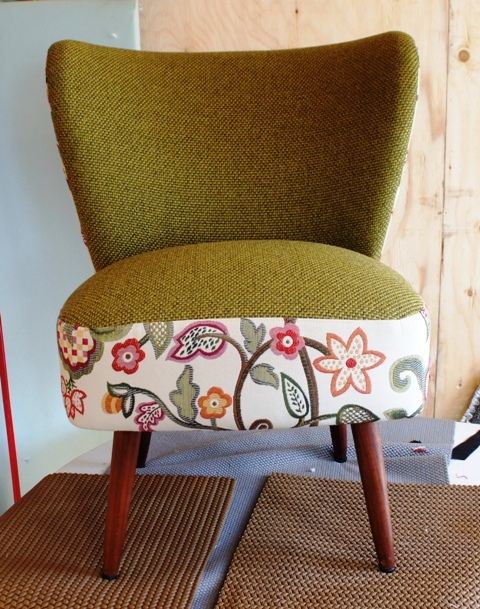 The personality of the piece is dictated by the shape of the chair and the fabric selections you use. Since there is not as much surface space on a chair versus a sofa, the number of fabrics used is typically smaller, or the size of the fabric cuts are smaller. Either way, you still end up with a unique and interesting addition to your home. Here are a few decorating ideas of accent chairs that have a small number of complementing fabrics with a lot of pizzazz. Looking for a more unconventional accent chair to really make a statement? Take a look at these chairs with wild patterns and colorful prints that are sure to make a splash! The beauty of incorporating a collaged piece in your home is the opportunity to think outside of the box. You can use more of the fabrics that you love; you don’t have to choose between that adorable blue ticking fabric, or the bountiful floral fabric you just can’t resist. Use them all to create a piece of furniture that will showcase your style and personality!